Located in Avrille in the Vendee, the house is just 8 mins drive to the beach at Jard Sur Mer and 12 mins drive to Longeville, with La Tranche sur mer under 15 mins. The popular tourist town of Talmont st Hilaire is also just 5 mins drive away (2 miles). This a great town with its own medieval castle and great shops including supermarket. 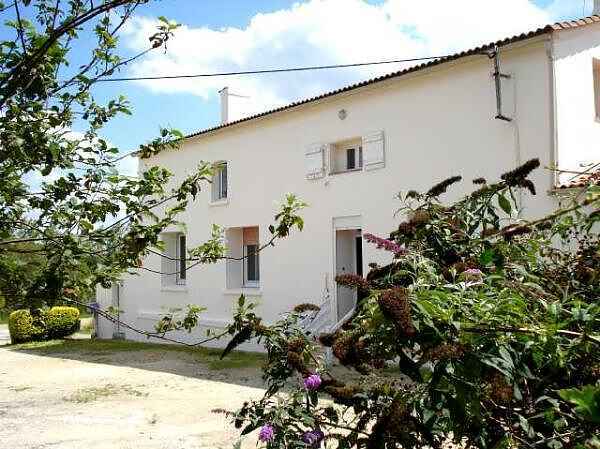 The house, Les Grandes Veliezieres, is set well back from the main road (the D949), and is surrounded by a farm, with loads of country walks all around. Its set within ¾ acre grounds which include an orchard, a wild pond (fenced in but toddlers beware!) and a great sun patio. There’s also a swing and climbing rope and a great big lawn for the kids to run about on (also ideal for football!). A magnificent 5/6 bedroom modernised farm house in ¾ acre of grounds available as holiday rent. The popular tourist town of Talmont st Hilaire is also just 5 mins drive away (2 miles). This a great town with its own medieval castle and great shops including supermarket. The house, Les Grandes Veliezieres, is set well back from the main road (the D949), and is surrounded by a farm, with loads of country walks all around. The house has been thoroughly modernised inside and boasts 6 bedrooms including a kids room with a double bunk bed and a modern kitchen with dishwasher, and washing machine/spin drier and oven. There’s also UK satellite TV, video and Playstation plus the obligatory central heating and a garage for 2 cars. Dogs allowed but under supervision especially around farm.